Los Lobos had already played longer than most of their recent Kansas City concerts when the veteran L.A. quintet invited guitarist Enrique Chi and percussionist Juan-Carlos Chuarand onstage for what turned out to be a 25-minute encore. Chi grew up listening to Los Lobos, and was already excited that his band, Making Movies, would share the bill, let alone the stage. “I didn’t know what they were going to play, I just grabbed my guitar and went for it,” Chi said. Hidalgo and his compatriots were extremely generous, coaxing both Chi and Chuarand into multiple solos, and insisting they stick around for the full encore set. I’ve seen Los Lobos five times in the past decade but had never seen them have as much fun as they were in that moment. The moment he started playing with his heroes, though, Chi fell into the zone. There was little contact between Making Movies and Los Lobos before that magical moment, but the camps have since been in steady communication. Before leaving town, Los Lobos ate at La Fonda el Taquito, the restaurant owned by Chuarand’s family. Making Movies were in Chicago for a show, but Los Lobos stuck around posing for pictures with everyone. The number wasn’t a surprise. Much like right now, the country was leading up to a big election year. It was startling the band would start playing requests just two songs in to the set. But what made “World Leader Pretend” seem so stunning was that I had requested it. Oh, I’m sure I’m not the only person who logged on to R.E.M.’s Website, selected the upcoming concert at Starlight Theatre and plugged “World Leader Pretend” into one of the three request slots. In that moment, however, it felt like the band was playing for ME, way up near the top of the theater bowl. That feeling was reinforced two songs later when Stipe announced another request. “Fall on Me” is my all-time favorite R.E.M. song, and occupied another of my limited request spots. Those two moments, coupled with that night being my first (and now only) time seeing R.E.M. in concert made the night an incredible experience that cemented my passion for the band. Eight years later the band was in a very different place. Drummer and not-so-secret weapon Bill Berry had left and the remaining trio had released three increasingly experimental records with decreasing results. They had toured faithfully during that time, but always skipped Kansas City. In 2003 they were pumping a greatest hits collection and the generally lifeless “Around the Sun” was right around the corner. In that moment R.E.M. seemed like Johnny Unitas with the Chargers or Babe Ruth with the Braves. “Accelerate” and this year’s “Collapse Into Now” proved they were more like Bobby Hull with the Jets. And now, nearly exactly eight years to the day1 after I saw them at Starlight, R.E.M. are done. Buck will probably continue to play sideman to Robyn Hitchcock and Scott McCaughey, Mills will make pleasant but unnecessary James Taylor-meets-Brian Wilson solo albums, and Stipe will direct films and make weird solo albums that sound nothing like R.E.M. 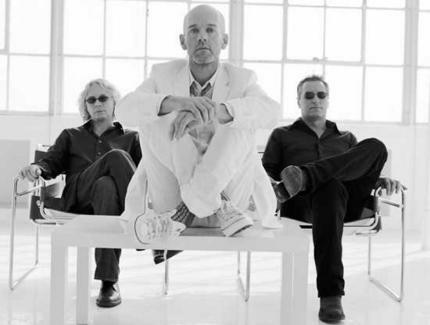 I’m happy that R.E.M. decided to call it a day instead of endlessly releasing uninspired product (I’m looking at you, Red Hot Chili Peppers). But I’m also sorry that I likely won’t hear the new sounds of three of my favorite musicians working together again. 1 Setlist.fm reminded me the concert was on Sept. 17, 2003. 2 If anyone has a real recording of this night, please let me know. 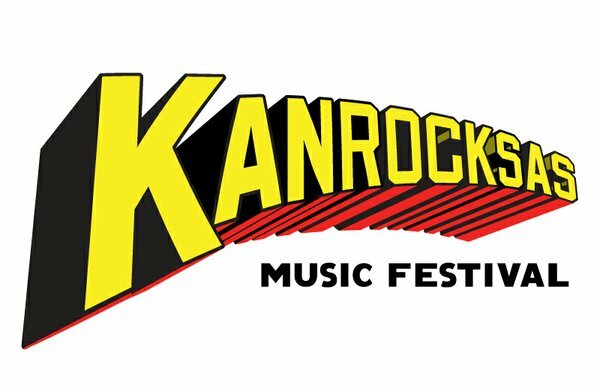 Note: For my coverage of the Kanrocksas music festival, I decided not to cover any band’s previously reviewed by The Daily Record. Visit the archives to read about theArctic Monkeys, Black Keys, Flaming Lips, Flogging Molly and Girl Talk. Go here to read a review of Day 1. The confessional California-based indie rock trio deserved better. Singer Beth Costentino’s intimate songs about frustrated crushes and missed chances wilted under the bright, blazing mid-day sun. Her lo-fi, straight-ahead songs are best suited for small, dark clubs, not 100-degree afternoons. Costentino and her rhythm section of Bobb Bruno and Ali Koehler made the best of a bad time slot, though. The trio plays with considerably more power than is hinted at on their full-length debut LP and the sound was full despite the lack of bass guitar (Costentino and Bruno both played electric guitar while Koehler held down the beat on his drum kit). The best moment’s of the 40-minute set were many of the same high points on the record: “Boyfriend,” which came out early, “Bratty B,” “Something In the Way” and the new song “When You Wake Up.” Colorful remnants of Friday’s Flaming Lips set still littered the ground as the band played. OK Go are better known for their videos than their music. Although the indie rock band’s 40-minute set showed they have depth beyond viral treadmill clips, their reputation is also fair. The four musicians took the stage wearing bright, monotone Crayola suits, invited a fan onstage to play guitar and donned white gloves before performing “What To Do” on hand bells. Lead singer Damian Kulash left the stage to perform a couple songs acoustically, surrounded by the crowd. Upon returning to the stage, Kulash pulled out a digital camera and took a picture of the audience, promising to post it on Facebook so everyone could tag themselves. That, my friends, is marketing 2.0. Behind the spectacle, the music was catchy and bouncy, filled with touches of New Wave and disco, a la Franz Ferdinand, and elements of the Cars, Cheap Trick and Roxy Music. High points included “White Knuckles,” “Do What You Want “ and “Here It Goes Again,” aka the treadmill song. The sun was just starting to set as A Perfect Circle took the stage. It was fitting, because this thinking-man’s metal band lives in the shadows and darkness. Each song was an exercise in subtly shifting textures and tempos, making each performance seem longer than it actually was. One third of the quintet’s dozen songs were covers. “People Are People” opened with a slow, building solo that placed the Depeche Mode hit in a completely new context. Likewise, a minor-key reading of John Lennon’s “Imagine” may have resembled how Mark David Chapman heard the anthem for peace. Songs like “Counting Bodies Like Sheep to the Rhythm of the War Drums” and “The Outsider” offered one of the weekend’s few opportunities for head banging and get the metal out. Each of the five band members stood on their own platforms, denying a single visual focus. Much of the pyrotechnics came from guitarist Billy Howerdel and beastly drummer Josh Freese, raised behind him. Singer Maynard James Keenan stood in the back left, out of the spotlight, back to the crowd. Former Smashing Pumpkins guitarist James Iha was elevated in the center. The layout provided easy access to several water stations, toilets and dedicated shade areas. The sound at all three stages and the DJ tent was surprisingly clear and aside from the large obligatory sound tents, all of the stages had decent sight lines. My biggest complaint was the placement of the Ad Astra Stage. While the Stagesaurus Rex and Main Stage faced each other at either end of the main field, travelling to the Ad Astra Stage forced crowds through several gated bottlenecks. This made bouncing between the Ad Astra to the main area take longer than necessary, and forced fans to choose between forgoing the final songs of the current set or missing the opening numbers of the next one. The Charity Village – a nice forum for local non-profits to introduce themselves to fans – was easily overlooked in the back of one of the vendor tents. It deserved more prominent placement. All told, the foundation for what I hope will be a longstanding Kansas City summer tradition was in place. It is doubtful that Irma Pince, mistress of the library at Hogwarts, would approve of Harry and the Potters. The band is loud, noisy and proud of its subversive punk influences. For nearly a decade, it has also been the delight of librarians across the country. The band makes a return appearance to the downtown branch of the Kansas City Public Library at 2 p.m. Sunday in a free performance and Monday at the Replay Lounge in Lawrence. Tying in to the most popular fiction series of the new millennium doesn’t hurt either. 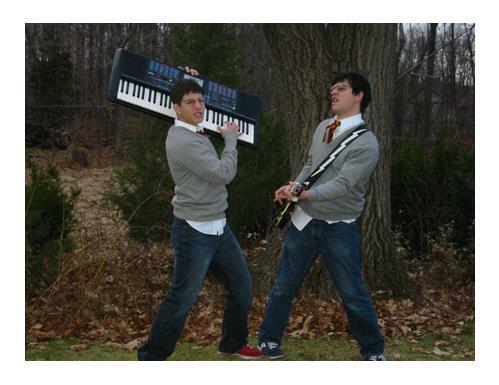 With songs such as “Gryffindor Rocks,” “Dumbledore’s Army” and “Saving Ginny Weasley from Dean Thomas,” the duo has plugged right into the zeitgeist. The band is among the more successful of a long list of wizard rockers, including such Potter-inspired groups as Draco and the Malfoys, the Moaning Myrtles and the Whomping Willows. They even gather for festivals, such as the annual Hallows and Horcruxes Ball in Manhattan, Kan.
Onstage, both brothers are dressed as Potter. Older brother Paul portrays the seventh-year wizard, while Joe represents Potter in his fourth year at Hogwarts. Although the family-friendly music attracts a young audience, Paul DeGeorge aims for a wide demographic. J.K. Rowling hasn’t weighed in on Harry and the Potters, but she is a big fan of the Harry Potter Alliance, a nonprofit group DeGeorge founded. 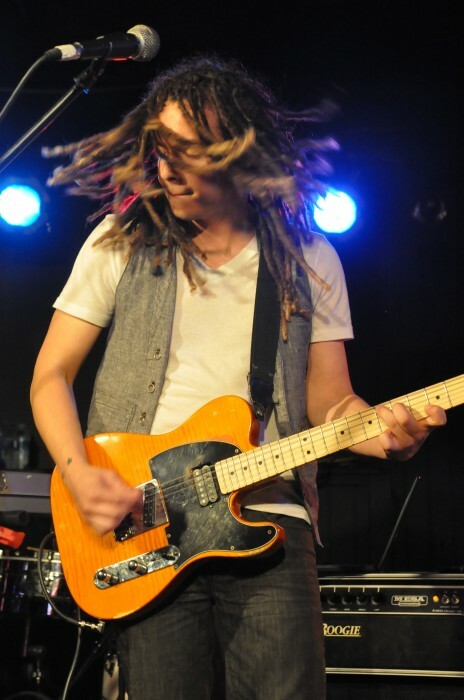 Although the band is strong, DeGeorge confessed it isn’t as all-encompassing since he moved from his native Boston to Lawrence, Kan. a year ago. DeGeorge moved away from his brother to be with his girlfriend, who is earning her doctorate in art history at the University of Kansas.